A week ago we released new wordpress theme for minecraft. As you can see here, Magicraft is specialy designed for Minecraft. It have many functions for Minecraft servers like Online status or Skins for changing design of your website. 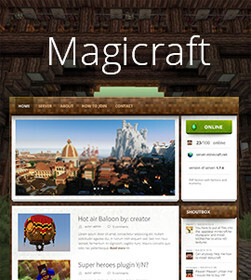 If know nothing about our new Magicraft theme, please visit our page.